Home » LIDF 2012 » Goodbye Mubarak! On January 25, 2011, the world was captivated as thousands of protesters flooded Tahrir Square in Cairo, demanding an end to the regime of President Hosni Mubarak. But the ground for the protests had been laid in the weeks and months preceding the mass outpouring of opposition. 'Goodbye Mubarak!' takes us to Egypt during the autumn of 2010, in the run-up to legislative elections. What we discover is a revolution-in-waiting already simmering under the surface of Egyptian society. Over several weeks, the documentary crew travels the country - from Cairo, to Alexandria, to the industrial city of El-Mahalla El-Kubra - introducing us to activists, politicians, and ordinary Egyptians. Activist Mahitab el Gilani walks through a market at night, urging people to sign a petition calling for the end of Egypt's draconian Emergency Law and for free elections. "If this conversation is broadcast on TV, we'll all be arrested," one woman tells her. Later, a man she approaches says he hopes she makes it out of the neighborhood alive. We also meet opposition candidates in the midst of their campaigns - feminist Gameela Ismail, liberal politician Ayman Nour (who was sentenced to five years in prison after winning election in 2005) and Muslim Brotherhood members Saad El Husseini and Hamdi Hassan. They may not agree on much, but all see endemic corruption, the repressive Emergency Law and the lack of political freedom as the key elements that must change if the Arab world's largest and most influential country is to move forward. 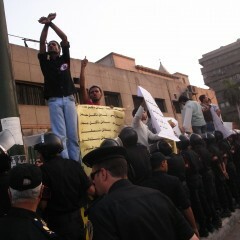 And while young, web-savvy activists get much of the credit for the demonstrations, 'Goodbye Mubarak!' shows just how deep opposition to the regime ran in the months leading up to the revolution. "We only have corrupt and old leaders with nothing to offer," says one angry pensioner. Another adds, "The solution is in the hands of our 12 million jobless kids. They need to go out, demonstrate, and overthrow the regime." Within weeks, Mubarak's opponents - led by many of those we meet in this film - would be doing just that.